I began reading the first pages of this book out of simple curiosity since I didn’t know what to expect from this book. I found myself unable to put it down. Even when I had to pick up my kids from school, I brought the book with me, parked the van, read some more until the bell rang signalling me I should get out to meet the children. It’s a good thing it was Friday, leftover night, so I kept on reading once I returned home. So what’s so interesting about this non-fiction book? Firstly, author Ben Sherwood writes so well he’s an absolute pleasure to read. I now use his work in my Creative Writing workshop as an excellent example of how to write non-fiction creatively. Secondly, I love the science of psychology and the physical, mental and emotional workings of the human brain. This book explores this through the fascinating look at how humans survive all types of crises, such as car and plane crashes, violent crimes, serious illness, the horrors of war and natural disasters. 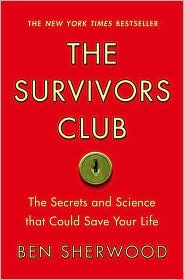 It attempts to answer the following questions as revealed in gripping true stories, astonishing scientific research and the author’s own adventures with survival tests: (1) What does it really take to survive? And (2) What kind of survivor are you? When I say gripping true stories, I mean it. They will leave you awed and shaking your head in disbelief. Among many of the findings, one that caught my interest (as well as the author’s) is the role that faith plays in one’s survival. He states that faith is the most universal survival tool, if not the most powerful. I wasn’t surprised to learn this, but it was great to see it on paper. This book is so jam-packed with interesting information that the word interesting doesn’t do it justice. I learned many things reading this book and I will pick it up again in the future. This is one of the best and intellectually stimulating non-fiction books I have read, and I recommend it to anyone who wants to learn a thing or two. 1- Only residents of the U.S. or Canada are eligible to win. 3- Please leave a separate comment for each of the entries. 5- For an extra entry become a follower by clicking on Google Connect or state if you are already following. 6- For a bonus entry post about this giveaway on your blog or post on the sidebar and send me the link. 7- Deadline February 17, 2010. Disclosure: Thanks to Anna of Hachette Book Group for sending this book for review. I was not compensated in any other way, nor told how to rate or review this product. I love this book too! I agree the stories were of the edge of the seat variety (even though I read this nearly a year ago I still can't forget several of the survivor's stories). I also always try to sit within 5 rows of an exit b.c you never know! cdziuba@aol.com I so hope I win! Your review has left me very interested in this book. Thanks for having this giveaway! Love to read to hear stories of survival. I'd LOVE to read this book. I do enjoy survivor stories. Thanks so much for having this give-away. Thanks for all the great suggestions! Makes the grey winter days passable! I am following your site! When I saw the title of your blog I just had to come and visit! Thanks for being a new resource for me!